Start your New Year off right with some IEI’s Women’s Networking Night! Tuesday February 28th, 5pm-7pm at Alter Hall, in the Undergrad Commons, under the ticker. Meet some professionals in your field and interact with students who are also as driven and motivated as you are. Time waits for no one so register now before it’s too late! We can’t wait to see you there! You should all get to know the faculty and staff of your major. Some of the people you meet could be instrumental to your success. Get to know your professors as well as any administrative staff. Here are a few reasons. Companies have connections with departments of interest. Many times companies have a contact with the department who may propose a great networking opportunity for you. So when companies are recruiting the best and brightest students, the department can put you in for it. The faculty can be more helpful to you. By making closer ties they may be more accommodating to your needs because they know you. Good friends help each other and it could be the same way in the department of your major. Things that they normally do not do for students may become more of a possibility. They may see your potential. Communicating with your professor and staff will give them the best judgment of who you really are. Be bold, exceptional and talk to them about something you found that is related to your major. Have discussions about latest trends. These people could see that you are a bright student and could potentially be a reference for a lifetime. Get to know the department members of your major. Good things can come out of it. You will always hear that networking is key and this untapped resource is a great place to network. The women adminstrators and faculty of the Fox School had the opportunity to listen to a presentation by Liz Dow, President of LEADERSHIP Philadelphia, and I wanted to share this information with you as well! Liz completed a project called the “Connector Project” which aimed to find the connectors in Philadelphia. 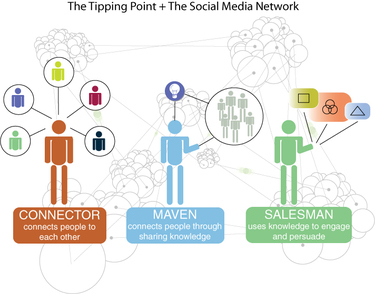 For any of you who have not read The Tipping Point: How Little Things Can Make a Big Difference by Malcolm Gladwell (which I definitely suggest you do) let me explain what a “connector” is. Connectors’s are the people who “link us up with the world … people with a special gift for bringing the world together.” Liz Dow has been called, by Malcolm Gladwell, Philadelphia’s #1 connector and she wanted to find others like her. In completing this project, she compiled a list of CONNECTOR COMPETENCIES that all connectors have. Think about that list above and think of those in your life that holds those competencies, they may even be competencies that you hold (Find out if you are a connector HERE). The important think to realize here is that the Connectors in your life are going to be the most helpful for you in your job search and in other areas of your life where it is important to know the RIGHT people. We always speak about networking here in the CSPD and sometimes it is a daunting task but if you can find just one of these connectors amongst your friends, teachers, acquaintances, etc. than you will have opened up the doors to numerous possibilities. Leverage your current relationships to help you as best you can. Especially in this current economy, the people we know will be that much more important in your job search. If you know anyone on THIS list than you are off to a great start! Think about it…. "The Strength of Weak Ties"
An influential American Sociologist, Mark Granovetter, created one of the most influential social network theories and one that is extremely helpful to all those in search for full time or internship positions.—THE STRENGTH OF WEAK TIES. Everyone says since I’m a business major, I should be “networking.” Sounds great, but I don’t have a clue how to get started. Any advice???? Hey Everyone! I got this question sent over to me through email and I thought it would be helpful for everyone to get some more information on NETWORKING! I know a lot of students think the whole concept is overwhelming and scary but it really doesn’t have to be. It is as simple as letting people around you know, you are looking for a job! Too often students rely on the “mass-email my resume to 1,000 employers” approach and then get discouraged when they only hear from 1 or 2 employers. There are many success stories of individuals who came across great positions on Monster.com and landed their dream job, but there are far more success stories of individuals who put themselves out there and met the right people, and landed their job that way. In the most recent surveys, 86% of people have reportedly received their positions through their networking efforts. Now, your lucky, the Fox School and CSPD have bridged a lot of the gaps for you with employers and many of them are right here on campus many times a year. You must take advantage of them. Listed below are the top 10 ways to network! This old cliche of talk to everyone you know couldn’t be more accurate. You would be amazed at how many business contacts you can come up with if you just take the time to ask your friends, parents, 3rd cousins, and distant uncles who they might know that could help you. These relationships need to be cultivated and regular updates on your job search are important. For weeks on end, every year, the CSPD has employers come into the office for no reason other than to assist our students with perfecting their all too important resume and interviewing skills. Whether you feel you need your resume critiqued again or not, this is a great way for you to have personal time with an company bigwig or hiring manager. Use the opportunity to start building a relationship that may pan out to a great contact down the road. Mock interviews are also a great way to let the employers tell you what they want to hear during an interview. If your dream job would be to land a position with JPMorgan and you see that they will be here on campus for a few different occasions, make sure you are there! There are numerous professional associations in the Philadelphia area that focus their meetings on networking and business card exchanges. Print up a few makeshift business cards and get yourself out there. The Chamber of Commerce is a good place to start but do some research. There is a Womens Referral Network that has a lot of great networking opportunities. The Young Professionals Network of Philadelphia is a great association to be involved in. There are also a ton of industry specific organizations to look into! Talk to your professors. Many of them have spent years in the field and years maintaining great relationships with others in their industry. See if they can refer you to anyone to speak to, see if they know of any companies hiring, and let them know of your goals. Many will be compelled to assist you reach those goals! An informational interview, though underutilized, can be one of the most effective tools in building your network and landing a job. Find a job you are interested in, find someone who currently holds that job, reach out to them and ask them if they would be willing to give you about 30 minutes of their time, either on the phone or in person. When you do speak with them, have well thought out and prepared questions such as: How did you get into the field?, what challenges did you face?, What classes would be especially important for me to have on my resume?, and MOST IMPORTANTLY, Do you know anyone else I should speak to that may be able to give me some more information on the field?. This is how you build your network. After meeting with them be sure to followup with a thank you and keep following up on a regular basis to let them know you are still looking for a job. Create a list of target employers and identify current contacts affiliated with these companies. Reach out to each insider offering something to attract their attention- not about asking them for a job! Make your communication about them, not you! Let them know you came across an interesting article they might like to read and send over the link, tell them about a good event you attended, etc. As mentioned in a previous blog, publishing and promoting a blog, establishing a web portfolio, joining and interacting on email lists or chats, producing a podcast, publishing an ebook, etc. can be really helpful. Periodically update these and inform your network contacts about your new developments. Volunteer for community education programs, school events, sporting activities, etc. where you can meet people and demonstrate your initiative and work ethic. In addition to the 2 career fairs through the CSPD, there are numerous other career fairs in the area. CSPD’s blackboard organization actually has a list of those we have come across in one section. Use these as a good opportunity to get your name out there and meet some people in a professional setting. Even if none of the companies particularly interest you, it is a great time to collect some business cards, practice your 30 second elevator speech, and get comfortable speaking with employers about yourself. Up to 80% of jobs remain unadvertised and hidden. It is up to you to find this hidden job market. Just because a company doesn’t have a position posted, doesn’t mean they are not hiring. Send a letter of interest, much like a cover letter, detailing what type of position you are interested in and ask them to please keep your resume on file for any positions that may open up. Followup with these employers and try and find someone in your network who knows someone in the company. These are just 10 ways to broaden your network. When I was in college, I remember hearing that it normally takes about 25 contacts with people to land an interview. This is a large number but can come easily if you get out there and network!